Shepard Fairey's claim that he had the right to use a news photo to create his famous Barack Obama "HOPE" poster became a widely watched court case about fair use that now appears to have nearly collapsed. By Friday night, his attorneys — led by Anthony Falzone, executive director of the Fair Use Project at Stanford University — said they intend to withdraw from the case and said the artist had misled them by fabricating information and destroying other material. Read the story here. That portrait now sits in the National Portrait Gallery. The National Portrait Gallery had an easy way out of this mess and I offered them the idea here, and even sent it to them, but all that I heard back was this. Had they taken my idea and run with it, they would be smelling like roses now, rather than having a work in their collection that allegedly violates copyright law. Are any of you out there aware of any DC artists (or exhibits) that have been experimenting with or featuring work that has been completed on the iPhone's Brushes application? DC area's own Frank Warren: Check it out here as PostSecret: Confessions on Life, Death, and God, enters the hardcover advice and miscellaneous list this week at No. 1. 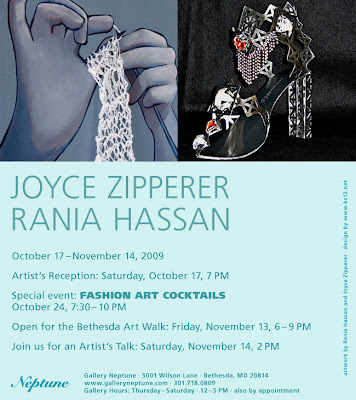 Two very talented multi-dimensional artists, Joyce Zipperer and Rania Hassan open at Gallery Neptune in Bethesda tonight. The opening night reception is Saturday, October 17, 7pm-9pm. The show will run October 17-November 14. Today I picked up my copy of the Gazette and was pleased to see a huge review by Jordan Edwards of Andrew Wodzianski's Abra Cadaver exhibition at Fraser Gallery. That's the only way that I get any news these days about the gallery that I used to co-own for ten years from 1996-2006. At the Fraser Gallery in Bethesda, a collection of Androids will fill the space until Nov. 14. The mixed media pieces are not new — they first appeared at the Warehouse Gallery in fall 2006 — but this is his first solo exhibition of the illustrations at Fraser. Nine have not been on display anywhere before. The series is inspired by Tomy's Mighty Men & Monster Maker, a late '70s and '80s toy that allowed children to create rubbings of creatures using interchangeable plates and a box of crayons. 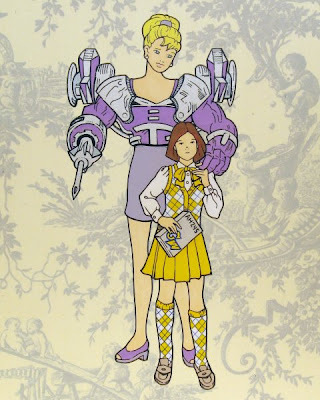 Spin-offs included cartoon characters and fashion models. Wodzianski received the original as a gift at age 4 and became fascinated with the differences between the girl and boy versions. He has purchased nearly 40 sets and uses rubbings as starting points for hand-drawn figures that he colors, cuts out and mounts on scrapbook paper. Raised in rural Pennsylvania and educated at the Maryland Institute College of Art, Wodzianski teaches at the College of Southern Maryland (CSM) and has been represented by the Fraser Gallery since 2001. The D.C. resident has had a few bruises along the way. After his first solo show at the gallery in 2003, Washington Post art critic Jessica Dawson brought down the hammer. He subsequently immortalized her in an illustration called, "Jessica, This May Sting a Little." "He was completely devastated by the review," gallery owner Catriona Fraser recalls. "So he's done this little homage to [Dawson], but it's nothing like it could have been. He could have been a lot harsher." Wodzianski shook it off and no longer views Dawson as a dream-crusher. The critic gave him a more favorable review last summer. "You learn to wear bad reviews like a badge of honor," he says. "I think her writings have become increasingly sophisticated, and I'm beginning to agree with her more often than not." "Jessica, This May Sting a Little"
Anyone in the art world will tell you: Realism has been done. Remember those cave painters back in 15,000 B.C.? Could those guys render a bison or what? ... only a near-cosmic alignment of skill and innovation will capture the attention of an art world entranced by its own progress. Not surprisingly, I guess, one branch of contemporary figurative painters, the ones not quite so talented or clever, have transformed attention-seeking into an art. ... Wodzianski's scenarios are fine camp. But is the artist in on the joke? Read Dawson's six year old review here. By the way, I agree with Andrew in the sense that I also think that Dawson's reviews and writing have improved substantially in the ten years or so that she has been freelancing for the Washington Post, ever since that day when Ferdinand Protzman quit as the galleries' critic in a dispute over assignments. The writing of the young Dawson to the more mature Dawson has mellowed out quite a bit and she's no longer the flame thrower that she used to be from her days in the City Paper to her move to the Post. I've been harsh on Dawson's writing many times in the past, but have also praised her writing when we align in ideas and opinions. And she has clearly become a better writer in the last few years. And better educated. By the way, the book that Jessica is holding (AH 245) is a GWU course titled "Seminar in European Art of the Nineteenth Century." "Collectors and their Collections," restricted to graduate students and taught by Prof. Robinson. "Abra Cadaver" runs through Nov. 14 at the Fraser Gallery in Bethesda.